Today is Epiphany and I have taken all the ornaments off the tree. Well, I think I have. It’s dark now and I won’t swear that I got them all until I can scour the tree in daylight. I hate to see the tree go, but I do enjoy de-decorating it. When I’m decorating it, I have to decide where to put each ornament as I go along. When I’m de-decorating it, I have assigned spaces for all of them. Most of them go in boxes. My favorites are the ones that have individual boxes with pictures on them. There’s no question about what goes inside that type of box. The only question is where to look for it on the tree. I turn on all the room lights and all the tree lights and it’s still challenging to find all the ornaments. I have notes on my boxes about what I should be looking for, because sometimes there are changes. The biggest change was in 2009, when our tree fell over. Twice. We didn’t lose much the first time because my grandson was there and broke the tree’s fall, but the second time there was quite a bit of damage. I have one box that holds a dozen fragile glass ornaments. There are only six left. I wrote a note on the top of the box so I won’t forget how many to search for. I fill in the extra indentations with small things that didn’t have boxes before the great tree disaster of 2009. One indentation is full of the little metal tops that came from the broken ornaments. I’m sure they’ll come in handy some day. I don’t buy fragile glass ornaments any more. I do like to add something new every year, even though we already have so many ornaments, it’s hard to fit them all on the tree. This year, we bought an ornament to commemorate our trip out West. We picked it up at a gift shop near the Grand Canyon and it’s a sturdy metal Kokopeli, with wire and stone accents. Every time we put it on our Christmas tree, we will remember that trip and the adventures we had, exploring deserts and climbing scary ladders and hiking on the Bright Angel Trail. I have an eclectic Christmas tree. It’s full of memories but it would never win any beauty contests. I remember visiting my high society aunt one Christmas season and seeing her fashionable tree. It was in her formal living room and it was covered in matching ornaments, plastic “sugarplum” characters that were in style that year. I thought it was pretty, but I couldn’t imagine having a tree with no memories on it. I have one of those sugarplum things in my collection now. One. It goes on my tree every year and it reminds me of my aunt, who probably got rid of all her sugarplums as soon as Christmas was over so she could have a new theme the next year. I will never have a stylish Christmas tree. There are some pretty raggedy things on my tree every year. 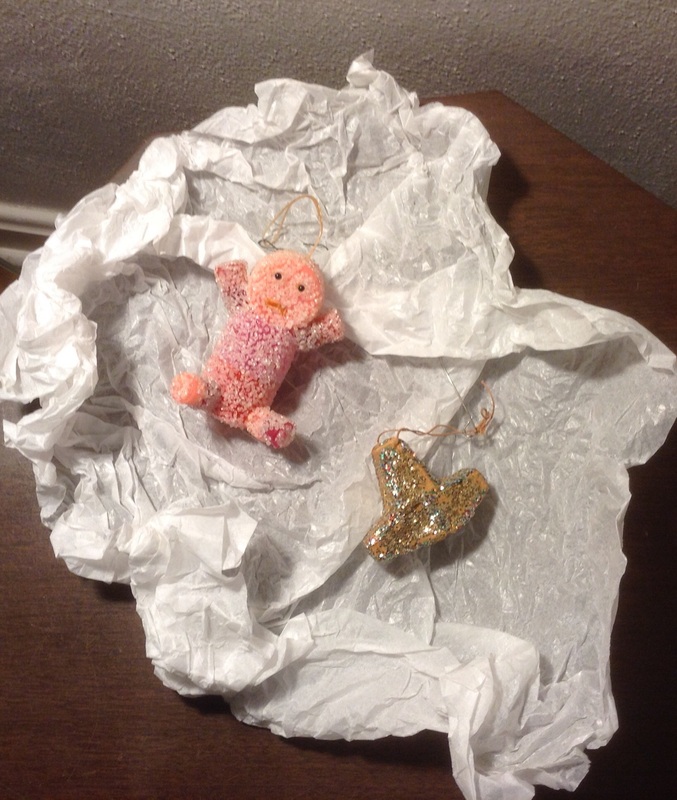 After my mother died, we found, among her treasures, some ornaments I had made as a child out of egg cartons and glitter. She had wrapped them as carefully as if they were made of blown glass. I do the same thing now when I take them off my own tree. I admired my successful aunt but I was never like her. I am like her younger sister, my mother, who chose sentiment over style, every single time. This entry was posted in Uncategorized and tagged Christmas, Christmas ornaments, Christmas tree, memories, sentiment on January 6, 2016 by releaf1954. The last time I wrote a blog post, it was Christmas Eve Eve and I was wondering how I would ever get all my Christmas wrapping done. Now it’s New Year’s Eve Eve and I can report that I did manage to wrap everything and still get some sleep on Christmas Eve. I’m pretty sure A Christmas Story was still on its first run-through when I crawled into bed, but I couldn’t swear to it. I was bleary-eyed by then. I hope I don’t cut it quite so close next year, but I’m glad I pulled it off one more time. I even managed to keep up with the sketch-a-day challenge. My drawings are not fancy but I have done one every day in the month of December and that makes me happy. The first year I joined the challenge, it seemed crazy to add one more thing to my already overloaded schedule, but I took it on and it gave me a nice spot of relaxation in each December day. Now I can’t imagine December without it. When I’m drawing, I’m not thinking about schedules or shopping or wrapping or baking. I’m just thinking about that one little object I’ve chosen to draw and how to capture it on paper. My left brain gets a rest and my right brain gets to have fun. I sketch the most ordinary things but they become unique and special as I get to know them well enough to draw them. This isn’t just any banana. 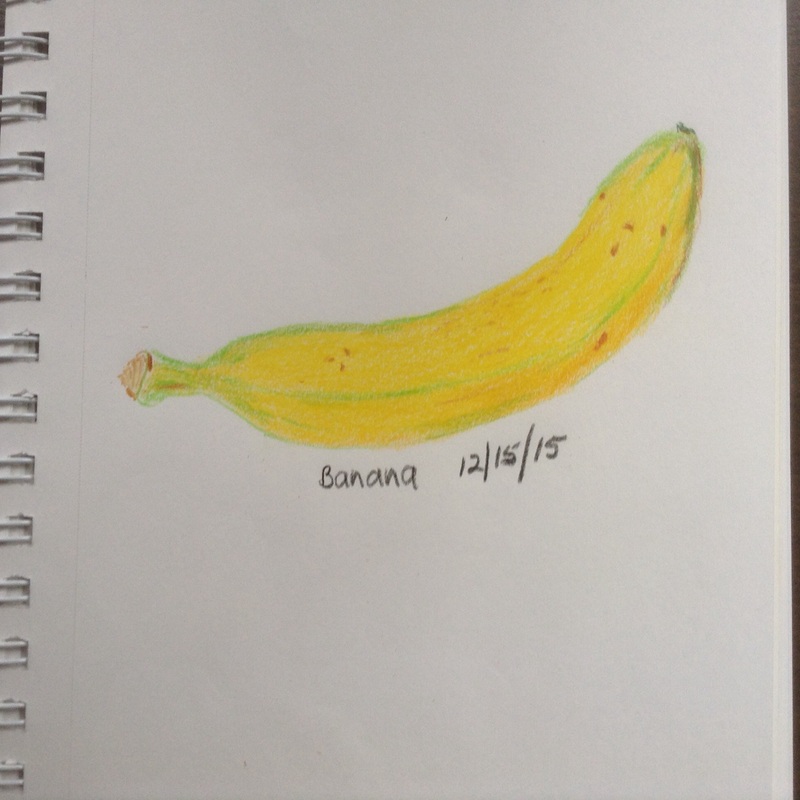 It’s the particular banana that was in my house December fifteenth, with it’s bits of green and little brown spots. And this is a specific green pepper that we bought so we could make chili for the family taffy pull on the nineteenth. This is the taffy. I was exhausted that day, so it’s a simple pencil sketch and I just noticed that I dated it wrong. I drew it on the nineteenth, not the twentieth. 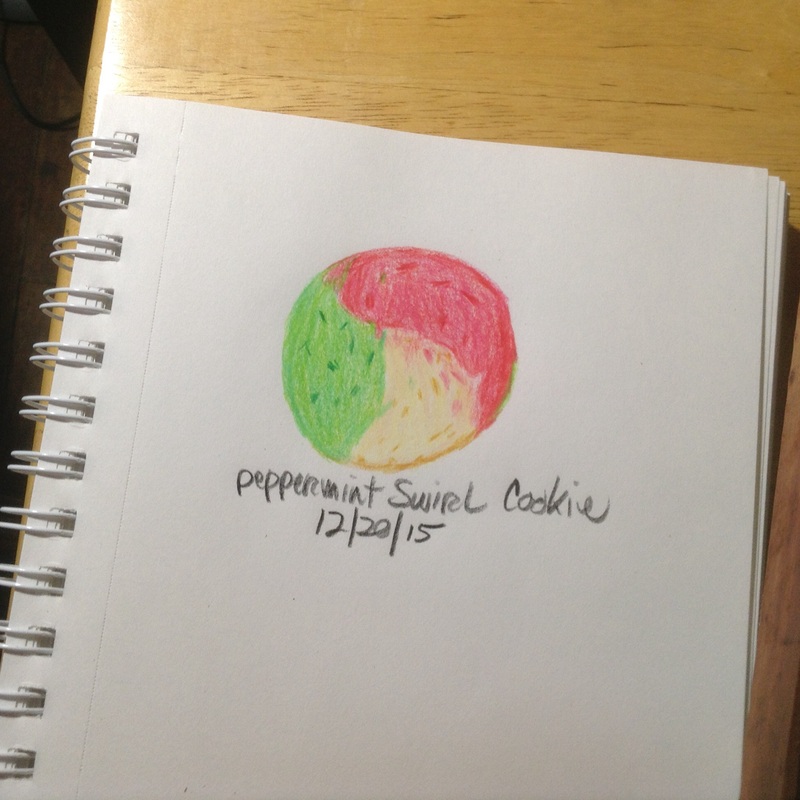 On the twentieth, I drew a cookie. I have been hoping the daily drawings would lead me gently back to painting. I still need to do forty plein air paintings before my next birthday and my next birthday is thirty-nine days away. I still intend to do it, but I know it’s going to be a crazy five weeks if I manage to make it happen. The drawings do help. They remind me that I always have trouble starting things but I’m pretty good at finishing them. They remind me that making art is a gift to myself. It gets me through tough times and it makes happy times happier. It heals me. It doesn’t need to do anything else. This entry was posted in Uncategorized and tagged art, Christmas, drawing, healing, New Year's Eve on December 30, 2015 by releaf1954. What, Wednesday again? Not only is it Wednesday, it’s Christmas Eve Eve. If you read last week’s post, you might be wondering how far I have progressed in my Christmas preparations. I would like to be able to say that everything is done and all I have to do now is sit around and drink eggnog, but that would be a big, fat lie. Not the eggnog part; I do have eggnog in the house, but I am not sitting around drinking it. I drank some earlier today as I was wrapping presents. I also drank some as I was baking cookies. Don’t worry; the cookies are fine. I don’t like alcohol in my eggnog. I like calories, lots of calories. As you can imagine, I’m having a little trouble managing regular meals. I’m not sure how long one can live on cookies and eggnog, but I’m hoping it’s more than a couple of days. I just need to get through a couple more days. My cookies are done and the ones that I made for folks outside my immediate family have been delivered. My tree is completely decorated and makes me feel happy every time I look at it. The family taffy pull was this past Saturday and the weather was perfect – sunny and cold with low humidity. Taffy making demands low humidity and we usually have to create it artificially by turning on the air conditioner, but not this year. This year there has been only one cold day in North Florida in December and it came exactly when we needed it. If it weren’t for wrapping, I would be in great shape. Wrapping is what I should be doing now, instead of writing, but I’ve kept my Wednesday blog post commitment all year and I’m not going to let it slide the last half of December. I can still get up before dawn and wrap all day tomorrow, right? I need to get back to wrapping. Right. Merry Christmas, everyone. Peace, love and light to you. I’ll see you on the other side. This entry was posted in Uncategorized and tagged Christmas, procrastination, wrapping presents on December 23, 2015 by releaf1954. Last week, I was pretty sure this week’s blog post would be easy. Last week I wrote about my lack of Christmas preparations. I had no tree. I hadn’t baked the first cookie. I hadn’t shopped for presents, which meant I hadn’t wrapped any presents. I was worried enough about it that I thought I would finally stop procrastinating and get something done. This week’s post would be all about my dozens of finished cookies, my beautifully decorated tree and my perfectly wrapped packages. 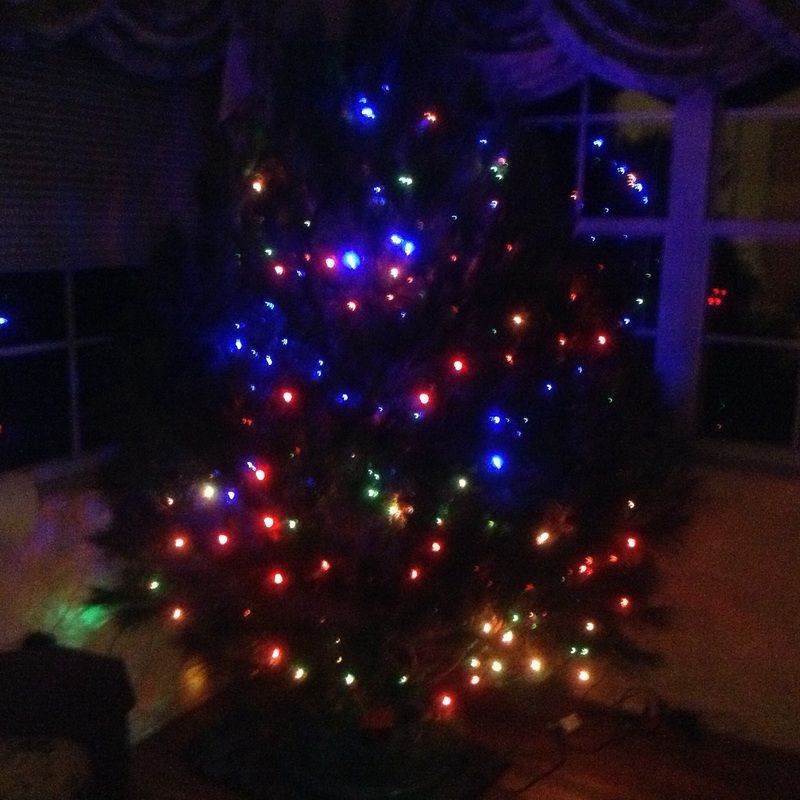 Well, there is a tree in my house now. My husband is putting lights on it as I type this. It’s evening, so that’s as far as we will get today. Once the lights are on, the next step is to put the burlap angel on top and that has to be done by a grandchild. No other decorations can go on the tree until we get a grandchild over here to put that angel on top. That’s a tradition, and we aren’t going to break it. Not this year. Cookies? I have baked two kinds of cookies. That’s two down and ten to go. I do have dough for two more kinds of cookies in the refrigerator. I’m trying to decide whether I’m ahead of or behind last year’s cookie-baking schedule. This time last year (according to my morning pages) I had three kinds of cookies completely done but no extra dough in the refrigerator. I guess I’m ahead on the dough-mixing and behind on the baking. Being ahead on anything is not that much of an accomplishment. Last year was the most frantic last-minute Christmas of my life. For any normal person, that would be the takeaway from last year’s morning pages. I, however, am not just any normal person. I am a seasoned procrastinator. I read about what I went through last year and all I see is that I managed to pull it off. Somehow, the baking got done, the tree got decorated, and the presents ended up under the tree by Christmas morning. I did it last year and I can do it again, even if I end up doing it in another mad last-minute rush. I’m afraid that might be my most cherished Christmas tradition. This entry was posted in Uncategorized and tagged Christmas, cookies, procrastination on December 16, 2015 by releaf1954. Wednesdays keep showing up, even in December. This is the second Wednesday in December and I still haven’t begun my Christmas preparations. My husband has put lights on the outside of the house, but we have done nothing to the inside of the house. We don’t have a tree. I haven’t baked any cookies. I haven’t done any serious shopping and all the wrapping supplies are still in the attic. I’m starting to feel a bit worried that this is going to be another frantic, last-minute Christmas, but at least I’m keeping up with the sketch-a-day challenge. Every day, I pick up my sketchbook and my colored pencils and I take a little sketch break. So far, I’ve drawn a lot of leaves and a couple of fruits and a nut. That’s what we have around this time of year in Florida. I took my daughter to the grocery store today and I finally remembered to pick up some small, round fruits while I was there. 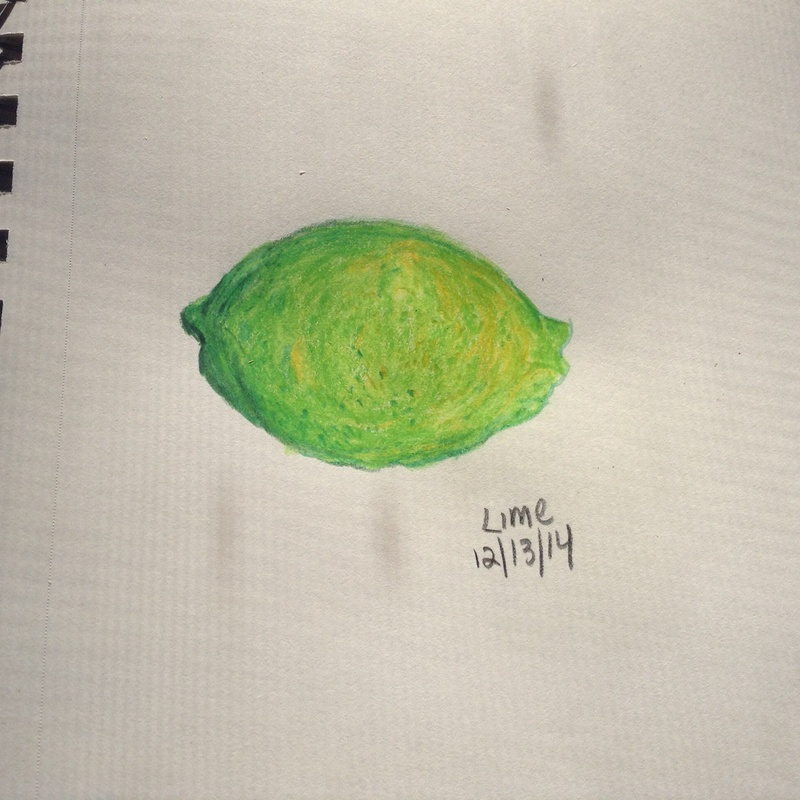 Soon I will be adding more drawings of fruit to my sketchbook. An unexpectedly magical thing happened on the way back from the grocery store. Our route crosses a railroad track and we saw as we approached it that the bars were down, though we couldn’t see a train yet. The person in front of us decided it was time to turn around and choose a different route. We stayed, waiting to see if it would be a freight train or a passenger train. We listened for the whistle. When we heard it, we turned in that direction to see what kind of train was approaching. 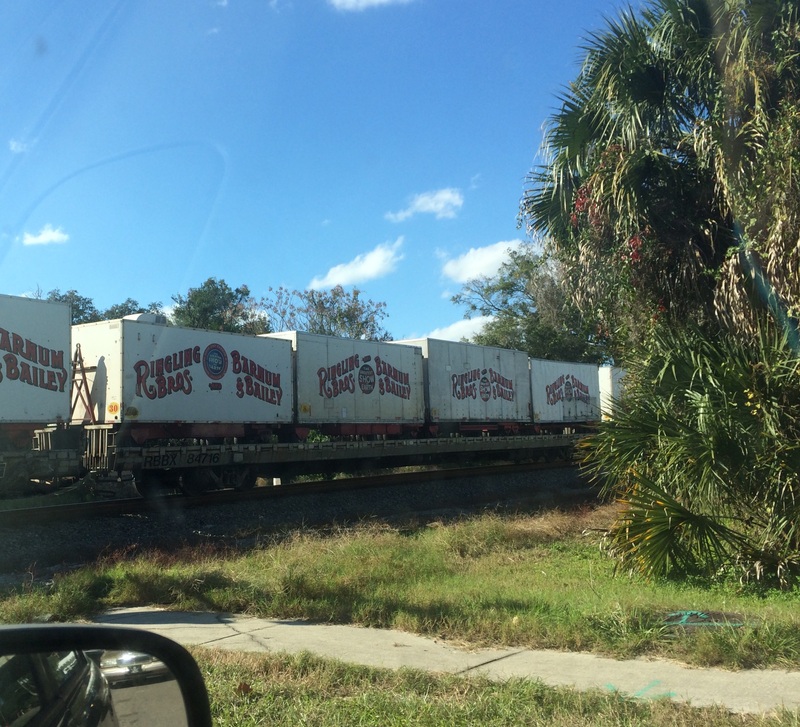 “Hmmm…,” we said, “…not a freight. Must be an Amtrak.” That thought made us happy because an Amtrak goes by a whole lot faster than a freight. We waited. As the train got closer, we started to see that it was not an Amtrak. It was way cooler than that. It was longer than an Amtrak but we didn’t mind. This entry was posted in Uncategorized and tagged Christmas, circus train, drawing, procrastination on December 9, 2015 by releaf1954. It’s Christmas Eve and it’s blog day. Somehow, I have done all the things I needed to do. I baked twelve kinds of cookies. I did all of my shopping – most of it in one day. The presents are wrapped and under the tree. I’m not sure how I pulled it off, but I do know that I am making a sincere pledge not to procrastinate next year. It’s a difficult balance for me. I didn’t realize it until my children grew up and left home, but I actually enjoy a certain amount of hustle and bustle at Christmas time. When the kids were young and I was working full-time, the thing I always dreamed of was a Christmas Eve like the ones I saw on the Jeffersons. Those folks were always sitting around on Christmas Eve in a perfectly clean apartment, relaxing and sipping hot toddies while admiring their perfectly wrapped presents under their perfectly decorated tree. I longed for just one Christmas Eve that involved relaxing. Mine involved gatherings at my mother’s house and my in-laws house, followed by all-night present-wrapping sessions. My kids would be knocking on the living room door at five or six o’clock in the morning, saying, “Can we come in now?” and I would be shouting, “Not yet!” because I needed to get everything wrapped before I let them start unwrapping. There was definitely no relaxing going on. I might have a hot toddy, but it would be sitting on the table at my side, at risk of being knocked over when I reached for the scissors or tape. Those days are long gone. I don’t live in the same house as my children now and I have time to wrap things in advance. Some years, I actually do it. I have had a relaxing Christmas Eve, when I had everything done and all I needed to do was sit back and wait for bedtime, drinking hot beverages and admiring my carefully wrapped packages under my delightfully decorated tree. It was peaceful. It was quiet. It was … wrong. How could it feel like Christmas if I didn’t have anything left to do on Christmas Eve? Going to bed and falling asleep to the endless loop of the “A Christmas Story” marathon just didn’t feel right after all those years of watching it while wrapping presents all night. I’m not a Jefferson. I’ve never moved on up and I can’t get used to a quiet Christmas Eve. 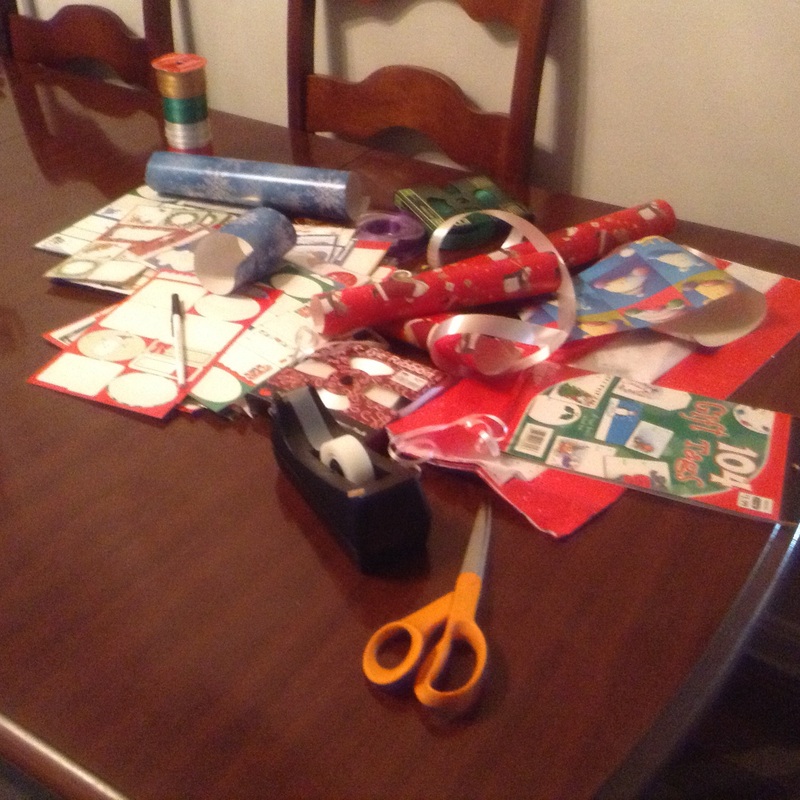 I’m too old for those all-night wrapping sessions, but I don’t want to have everything done in advance. I’m still figuring out the balance. I definitely over-procrastinated this year. I love wrapping presents and it’s a lot more fun if I spread the sessions out over a week or so. I’ll try to remember that next year. I’ll also try to remember that stuff happens. You may have enough time to get everything done, but if it’s just barely enough, what do you do when there is unexpected severe weather? Or when you can’t leave the grocery store parking lot because you parked near a Corvette which is being winched on to a wrecker just behind your car? These kinds of things are out of your hands. You have to be able to allow for unplanned incidents that impact your ability to keep to your schedule. I’m only sixty. I still have time to learn. Right now, I need to publish this blog post and then go to the kitchen and put away my last batch of lemon cheese bars. Then I’ll be ready to go to bed. It’s past my normal bed time, but it’s nothing like those days when my children were young. 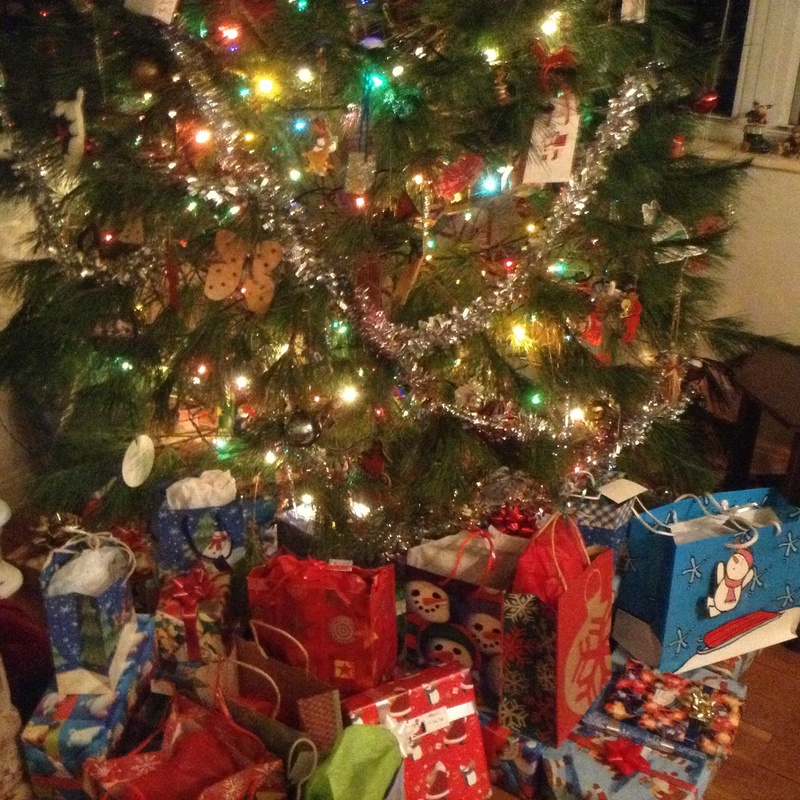 Tonight, the presents are already under the tree, and I get to sleep. This entry was posted in Uncategorized and tagged Christmas, Christmas Eve, procrastination, wrapping presents on December 24, 2014 by releaf1954. Wednesday is blog day. I just realized I have set myself up to be posting on Christmas Eve. I sure hope all the things I’ve been putting off will be done by then. We have a tree, but it’s not in the house yet. I’ve barely started my shopping and I’ve only baked three kinds of cookies, out of twelve I intend to bake. On the upside, I’ve kept up with the December Daily Drawing Challenge. There have been more fruits and vegetables floating in space. There have been leaves. 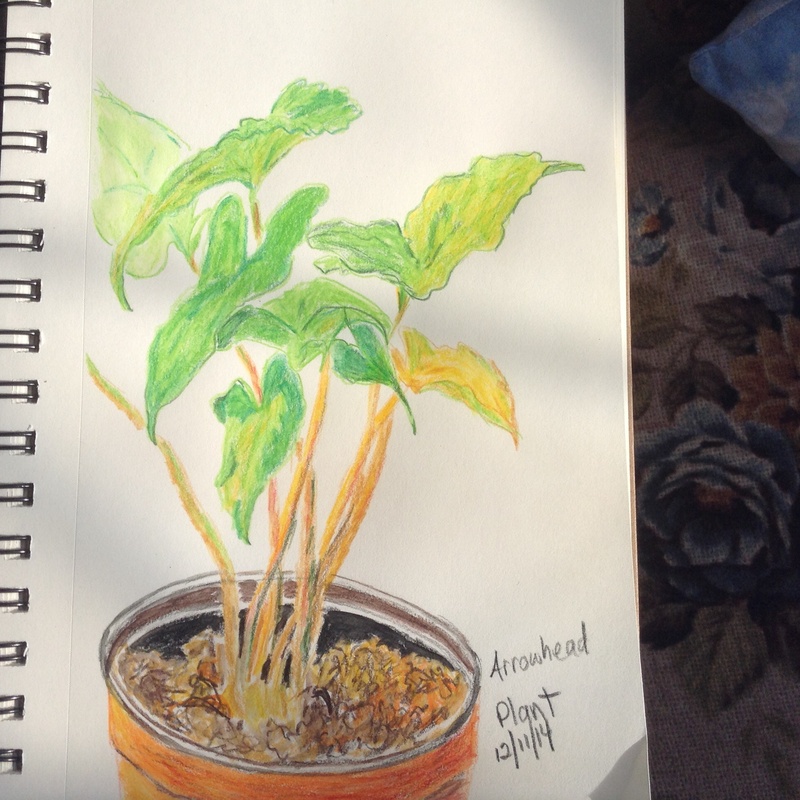 One ambitious day, I drew an entire potted plant. It was fun because I drew it last year, when it only had two leaves. Now it has ten and I managed to capture eight of them. I’m happy with this drawing. I’m also happy with this onion. It was a challenge because I was working with a small set of watercolor pencils. 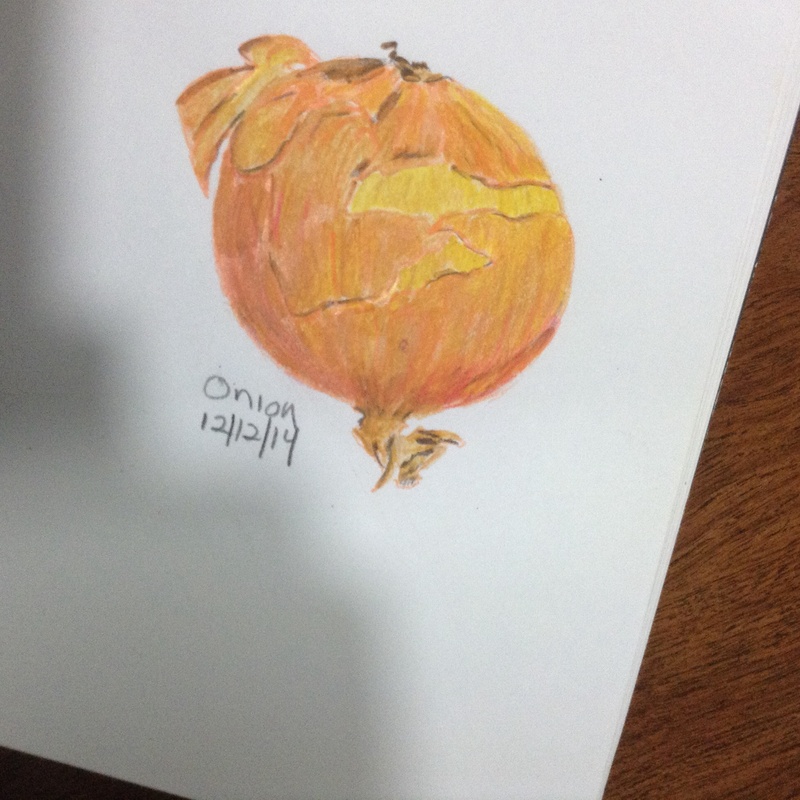 The only brown in the set is dark umber and that’s not very useful when drawing an onion. I had to blend yellows and oranges to get this done and I like the way it turned out. 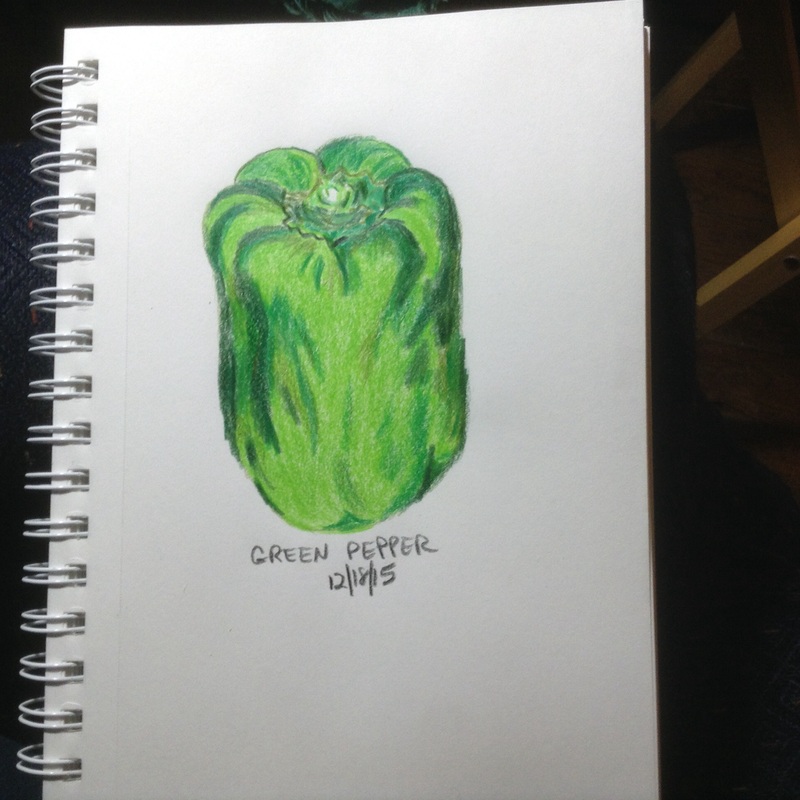 A green fruit is a bit easier because there are three shades of green in my tin of twelve watercolor pencils. Three greens – an embarrassment of riches! I don’t have a lot of words left in me today, so I’m going to wrap it up now. 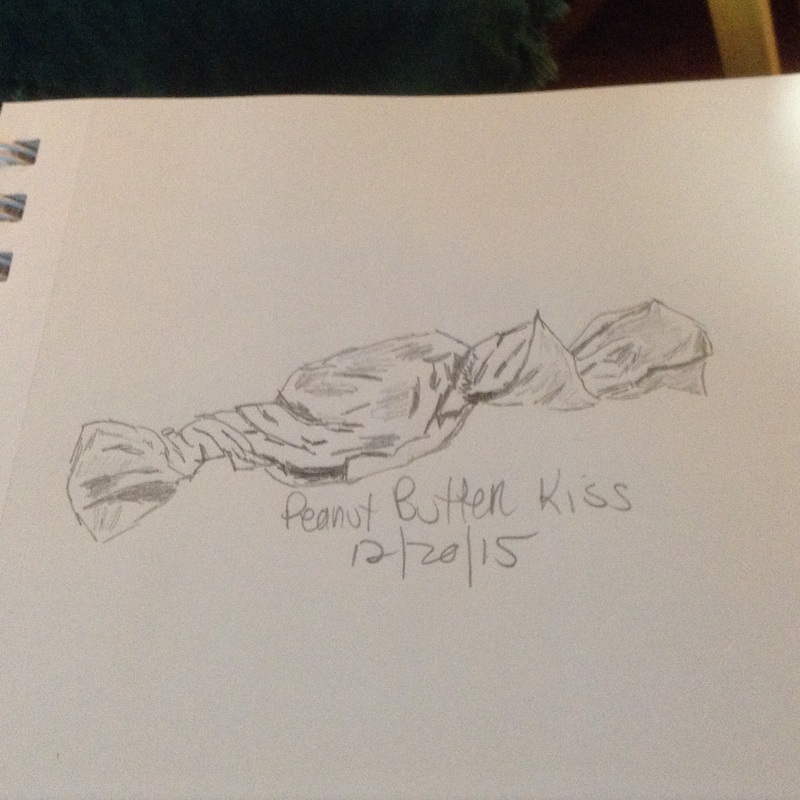 The Daily Drawing Challenge is not what’s keeping me from getting my Christmas shopping, decorating and baking done. That’s my own lethargy. The Daily Drawing Challenge is the good part of my day, the time when, against all odds, I actually get something done. Thanks again, Grace. I’m enjoying this! This entry was posted in Uncategorized and tagged Christmas, drawing, lethargy, procrastinating, watercolor pencils on December 17, 2014 by releaf1954.